View cart “Ultra Biotic X100 – Daily Potent Probiotic with 100 Billion CFU/Serving” has been added to your cart. Purchase this product now and earn 488 Points! Basically, probiotics are a way for you to give your intestinal tract superfood designed to help improve your health. You may have known all that, but do you know why it’s important to take probiotics? It turns out that the bacterial species in your gut impact nearly all facets of your health. They help you produce neurotransmitters that balance your mood. They help you absorb nutrients and calories (bad bacteria make you absorb MORE calories). They help reduce inflammation both in your gut and in your entire body. They help balance your hormones. They influence your GI tract, stomach acid, and bowel movements. They protect you against autoimmune disease and balance the immune system. They digest particles of food and create energy that your body can absorb. The point is, these probiotics are INCREDIBLY important and making sure the concentration of bacteria in your gut stays healthy should be your top priority. But still, why do you need to take probiotics? Almost every aspect of your life has some effect (positive or negative) on the bacterial concentration in your gut. Want to eat some ice cream? You’re promoting the growth of BAD bacteria. Are you under a lot of stress from work? Your stress is killing off good bacteria. Have hypothyroidism or other hormone problems? These imbalances change your microbiome. Don’t want to work out because you are tired? Not working promotes unhealthy bacterial levels. Basically, every action you take is either promoting healthy bacterial growth or helping promote unhealthy bacterial growth. You probably know what things promote HEALTHY growth and what things promote UNHEALTHY growth – so we won’t go over those now. Instead, I want to focus on the need for probiotics. Taking probiotics is a way for you to fight back against the normal everyday stressors of your life. They can help promote the healthy growth of bacteria while killing off the negative bacteria – it’s a win-win. Do probiotics help with weight loss? The answer is that YES, they absolutely can help with weight loss. Probiotics have a number of beneficial effects that, when added together, may help alter caloric absorption and caloric burn. #1. Probiotics may alter intestinal bacteria and help REDUCE the total number of calories that you absorb with each meal. Did you know that the amount of calories you absorb from each meal depends on the type of bacteria in your gut? Unhealthy proportions of gut bacteria promote INCREASED absorption of calories. This means that two people (1 person with healthy gut bacteria and 1 person with unhealthy gut bacteria) can consume 100 calories of food, and the person with the unhealthy gut bacteria may absorb 90 of those 100 calories while the person with the healthy gut bacteria may only absorb 70 of those 100 calories. With this in mind, you can alter the number of calories you absorb by improving your microbiome. #2. Probiotics may help alter your appetite and help reduce cravings for unhealthy foods. Does it feel like you have cravings for unhealthy foods, fatty foods or sugary foods? If so it might surprise you to know that the population of certain bacteria in your gut may be the source of these food cravings. When you eat unhealthy food you are promoting the replication of unhealthy bacteria in your gut (this could be from eating ice cream, refined sugar, soda/diet soda, etc.). As the unhealthy bacteria grow they begin to secrete cytokines into your bloodstream that alter neurotransmitter levels and increase your cravings for certain foods. They do this because THEY survive off of the unhealthy foods, which means you have to keep eating those types of food in order to help keep them alive. The reverse is also true with healthy foods. The more healthy foods you eat the more likely you are to crave healthy foods. At the center of these cravings is your gut bacteria and it can be manipulated by taking probiotics. #3. Directly influence and lower “fat storing” hormones such as insulin while improving thyroid hormone which is involved in regulating your metabolism. Lastly, and probably most importantly, the bacteria in your gut influence certain “fat storing” hormones such as leptin and insulin. It has been well established through various studies that the environment of your GI tract may promote the development of a condition known as metabolic syndrome. Metabolic syndrome is a constellation of diseases which results in increased inflammation in the entire body, increased fat deposits in the belly, bad cholesterol and high triglycerides. This combination of diseases plays a significant role in the development of cancer, stroke and heart attacks. We don’t know exactly what causes all of these problems but we do know that your gut plays a role in the development and potentiation of metabolic syndrome. Taking probiotics is the first step to aligning your microbiome and intestinal bacteria to help reduce insulin resistance and weight loss. Gut Bomb contains 18 species and strains that have been clinically shown in studies to be effective (see studies below). The relative concentration of probiotics is broken down to a unit known as CFU which stands for colony forming units. Like other supplements, the CFU is a good indicator of how “strong” or how “effective” your probiotic supplement will be. Just going to the grocery store and purchasing a random probiotic will most likely NOT be effective unless the potency reaches a critical point. Otherwise, you risk not putting enough of the probiotic into your body to make a difference. This concept holds true for other supplements, medications and pretty much anything else in life. Taking a supplement which has 10+ strains but only 5 billion CFU in each serving will likely NOT result in significant weight loss for you (although you will be lead to believe it will). Compare that to most studies which use anywhere from 300 billion CFU up to 900 billion CFU per serving. With the average probiotic dose around 15-20 billion CFU per serving, these studied concentrations contain up to 20 to 60x higher doses and is largely the reason why they are so much more effective. Dosing (CFU per serving) makes a big difference in weight loss. Why is Gut Bomb 350 Billion so Effective? We’ve already hit on many of these points but it’s worth expanding on what makes certain probiotics better than others. Only certain probiotics have been proven through clinical studies to help with weight loss (at least at this point). This probiotic contains all of those species and strains. Point #2: Comes climate controlled in individual package. ALL probiotics will slowly die over time until they are consumed and used in your body. The rate at which these little guys die depends on a number of different factors. One factor is the climate. Certain probiotics need to be refrigerated and sheltered from the cold in order to survive. If this isn’t done then you risk only getting about 50% or less of what the “estimated” dose is on your probiotic. As an example, Gut bomb 350 Billion is formulated with 650 billion CFU at the time of manufacture and this is done to ensure that each dose that YOU get is 350 billion CFU. Point #3: Each packet is sheltered from light and moisture. Gut bomb 350 billion comes in a foil-lined individual packet which is sealed and protects the probiotics on the inside from light and moisture. Point #4: Contains temperature controlled probiotics that will last during transit. The probiotic species inside gut bomb 350 billion do not need to be refrigerated. This helps ensure that you will get the maximum dose of CFU by the time it arrives at your door. 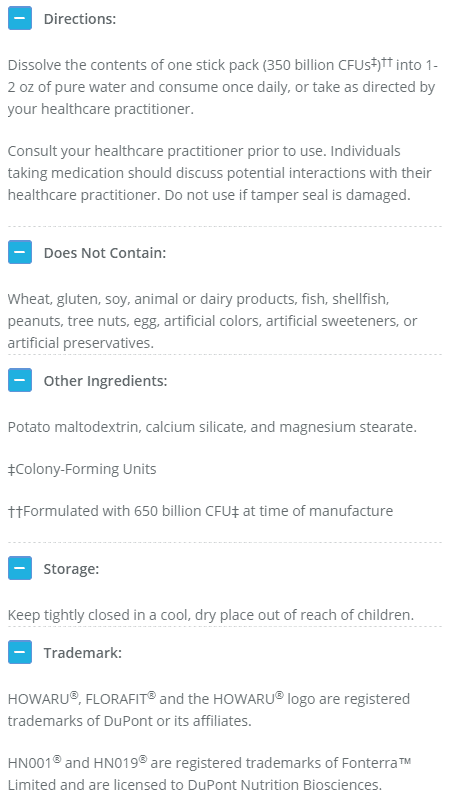 Point #5: Contains 300+ Billion CFU in each serving. 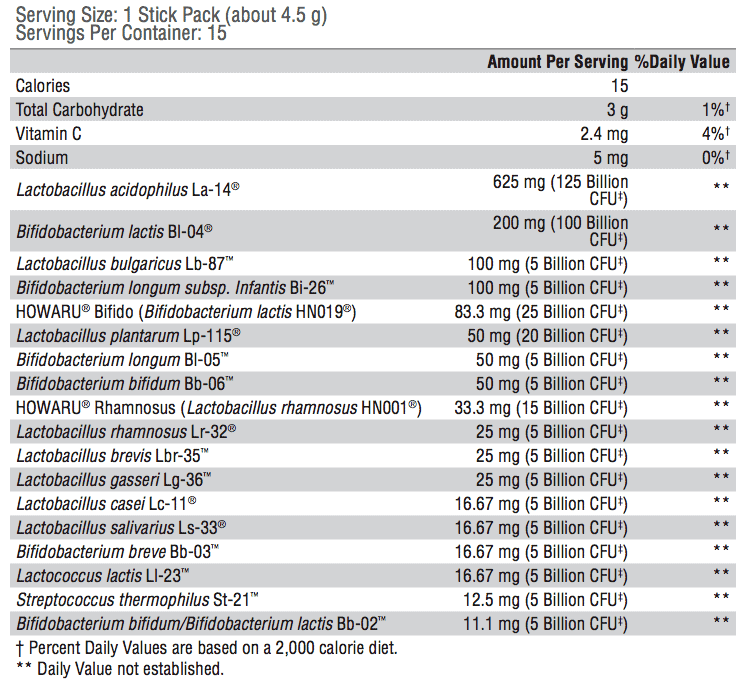 Very few commercial probiotics contain dosages as high as 300+ billion CFU per serving. Please see the information above regarding why this is so important. #1. Use Gut Bomb 350 Billion daily x15-30 days (depending on how much weight you have to lose. #2. Combine gut bomb 350 billion with supplements designed to reduce inflammation and increase thyroid function. #3. Add fermented foods/vegetables to your diet each day while using this probiotic. #4. Combine gut bomb 350 billion with exercise (emphasis on strength training) at least 1x per week for 20-30 minutes. #5. Aim for 5-10 pounds of weight loss each month and be patient! (If you lose more than 5-10 pounds per month you risk worsening leptin resistance and re-gaining your weight back). 1.) How should you take Gut Bomb 350 Billion? Gut bomb 350 billion can be taken with or without food. I recommend that you use this supplement without food unless you get some nausea if consuming it on an empty stomach. Remember that gut bomb 350 billion is an ultra potent probiotic which means that it has a very high concentration of beneficial bacteria in each dose. For weight loss, you will want to be more aggressive which means you will want to use a higher dose more frequently than other conditions. Start with using 1 gut bomb DAILY x15 doses. After 15 days you can go down to every other day use x15 days. From there (depending on how much weight you want to lose) you can then use 1 packet every 3-5 days (again depending on your results). If your intestinal health is in order then you can use the maintenance dose of Gut bomb 350 billion which is 1 packet every other day to every third day. If you are just starting I recommend 1 packet daily x7 days then 1 packet every third day x21 days. The use for other intestinal issues will depend on your body, but I recommend starting with 1 packet daily x7 days then 1 packet every third day x21 days. From that point, you can continue with 1 packet every other to every third day (once your symptoms have improved). 2.) Are there any side effects? Gut bomb 350 billion is generally well tolerated. Some people report mild nausea if they take gut bomb 350 billion on an empty stomach, but most patients tolerate the probiotic very well and only notice an improvement in symptoms. 3.) How long do I need to take it? For weight loss, you will want to continue using this supplement for 3-6 months (depending on weight loss results). For intestinal health, I recommend that you use the maintenance dose for 6 months to properly restore beneficial bacteria in your gut. The amount of time you need to take it will depend on your body and your results. 4.) Will Gut Bomb interfere with my thyroid medication? As a precaution, we recommend that you take this supplement (along with others) 30-60 minutes away from your thyroid medication. 5.) Will Gut bomb work if I don’t have thyroid problems? YES! Gut bomb was designed to provide a healthy blend of probiotic species that will help people with and without thyroid issues. 6.) Is this supplement safe for vegans? Yes, this is a vegan safe supplement. 7.) Does this supplement have gluten, dairy, soy or any other ingredients? No, we go to great lengths to ensure that our products are pure and 100% all natural. This product does NOT contain Wheat, gluten, yeast, soy, dairy products, fish, shellfish, peanuts, tree nuts, egg, ingredients derived from genetically modified organisms, artificial colors, artificial sweeteners or artificial preservatives. 8.) How does shipping work? All product orders receive free shipping. We ship out within 1 day of your order (unless you order on the weekend) and it takes approximately 1-3 days to reach the destination depending on how far you live away from Arizona. All supplements are shipped with free shipping via first class mail through USPS but you can upgrade to priority mail if you prefer as well. You will receive an email notification once your product is “completed and shipped”. 9.) What is your Return/Refund Policy? All supplements have a 30-day money back guarantee. We want you to take a chance to improve your health and use our high-quality supplements. If you don’t love your supplement simply contact us, ship back the supplement and we will happily provide you with a full refund. You can find more information about our return and refund policy by clicking here. 10.) What if I have other questions? Please reach out to us via email at [email protected] and we will do our best to get back to you within a day or so! Questions about our quality standards? Please see this article for more information. I really needed this for my whole being. I know that I have had gut issues in the past for decades and always felt that I had finally gotten over the hump. I didn't notice anything really different but after taking the second batch, I felt that my body was happy. It was good for me and I would do this gut bomb several times a year for sure. I’ve been taking it faithfully and have seen no changes; and I mean, no changes. I have lost no weight despite eating clean. I’m discouraged and don’t know if I should keep on or stop. Hi Marie, Thanks for sharing! Please note that this is not an isolated weight loss supplement by itself and you shouldn't be expecting immediate weight loss results (that's not how weight loss happens), instead it helps promote a healthy metabolism and improve gut function which can then help you lose weight. But even then, this should ALWAYS be combined with a healthy diet, exercise, intermittent fasting, and other therapies (as necessary). If you aren't already doing those things then I would recommend you add those, if you don't wish to continue with the probiotic please reach out to us via email at [email protected] and we can help you with your return. Both my husband and I really like this protein powder. I have trouble with many powders but not this one - tastes good, mixes well and feel good from it. I only wish it were a little less $$! Great Probiotic that is ending my painful constipation. I am 42 years old and female and for the past two years have had chronic constipation that’s actually quite painful. I need to lose some weight too and I think clearing up the gut issues will allow that to happen. Hi Jennifer, Thanks for sharing! Please keep us updated on your results.